The website and its content is owned by Self in the City, Inc.(“Company”, “we”, or “us”). 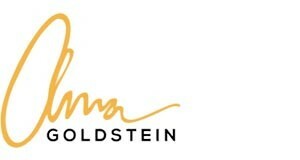 The term “you” refers to the user or viewer of www.annagoldstein.com (“Website”). Please note that the information above (“Personal Data”) that you are giving to us is voluntarily, and by you providing this information to us you are giving consent for us to use, collect and process this Personal Data. You are welcome to opt-out or request for us to delete your Personal Data at any point by contacting us at info @ annagoldstein.com.